"Arizona gun laws in L.A.? 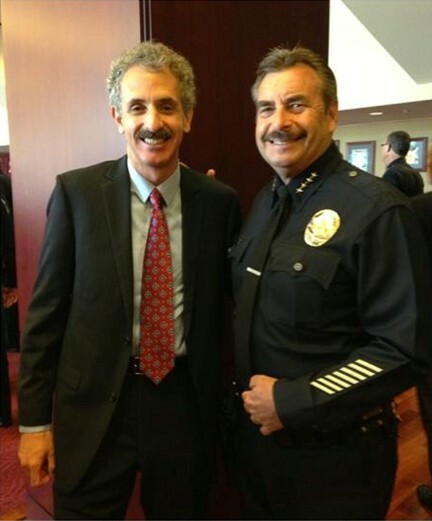 It could happen," an editorial in The Los Angeles Times penned by L.A. City Attorney Mike Feuer and LAPD Chief Charlie Beck warns. "Two bills stacked with legislative sponsors - HB 38 in the House, SB 446 in the Senate - would override our state's longstanding rules governing who is allowed to carry a concealed, loaded firearm in public," Feuer and Beck explain. "These bills, both called the Concealed Carry Reciprocity Act, would dictate that if a person can carry a concealed weapon in any state, that person could carry it everywhere in America. This should be a call to action for all Californians concerned about keeping their families safe." "In addition to jeopardizing public safety, concealed carry reciprocity would endanger the lives of law enforcement," they lie. "The mere presence of more concealed weapons on California streets would make police work here much more hazardous." Yes, I wrote "lie." First by employing the loaded term "dictate," as if their "right" to usurp powers is being infringed. And that "blood in the streets/Dodge City over fender benders" hysteria has been used by the gun-grabbers every time a state has considered adopting "shall issue" permitting laws. It not only doesn't come true, leading honest LEOs to admit they were wrong for opposing it, it also increases the sampling size to where objectively, another inconvenient truth becomes apparent. "Permits have been revoked for firearms-related violations at rates of thousandths of one percentage point. Civilian permit holders are less likely than police officers to be convicted of a firearms violation." In true Opposite Day fashion, Feuer's and Beck's "progressive" stance is actually one desperately clinging to the past to maintain L.A.s "may issue" permit system. That generally means "may not" as far as commoners are concerned, ensuring the only non-law enforcement citizens allowed to "legally" carry are well-connected political elites and celebrities.